Luxury Cars and Watches - Boxfox1: The BMW Concept X4. The next chapter in the sports activity coupé story. The BMW Concept X4. The next chapter in the sports activity coupé story. Every new BMW X model is a trailblazer. Indeed, the world premiere of the first BMW X model (the BMW X5) in 1999 saw the BMW Group call into being the Sports Activity Vehicle (SAV) segment – one in which BMW X models remain the market leaders. The BMW X3 and BMW X1 were likewise the first SAVs in their class and continue to set the pace among their rivals today. This development took on a new dimension in May 2008 with the introduction of the BMW X6 – the first Sports Activity Coupé (SAC). This still unique concept brought together the rugged looks of a BMW X model with the emotion and sporting character of a BMW Coupé for the first time. The enduring popularity of BMW’s first SAC is demonstrated by its consistently high sales figures. The short history of the BMW X range is already a successful one. Since the first BMW X model took to the stage, average sales across the BMW X line-up have been on a constant upward curve: one in four new BMW cars globally is now a BMW X model. 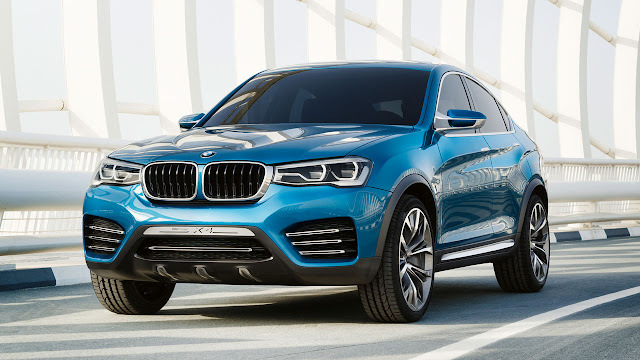 With the BMW Concept X4, the BMW Group offers a preview of the future of the BMW X family. It takes no more than a glance to see how smoothly the qualities of a BMW X model can blend with the genes of a BMW Coupé. 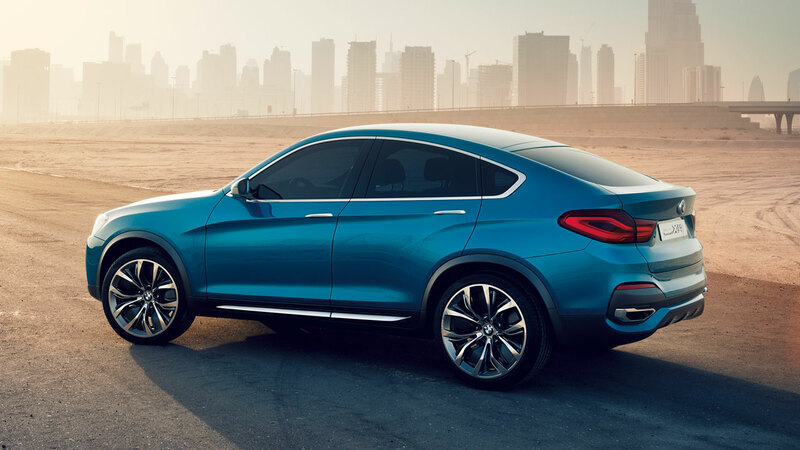 The new Sports Activity Coupé concept from BMW is poised to continue the success story of the BMW X6 in a new vehicle class. Eye-catching proportions, tight contours and high-quality details produce an unrivalled product character brimming with emotional appeal, dynamism and the sturdiness you would expect from a BMW X model, while at the same time holding out the promise of out-standing performance and driving dynamics. All of this can be experienced when the BMW X4 production model rolls out of the factory for its market launch, scheduled for 2014. 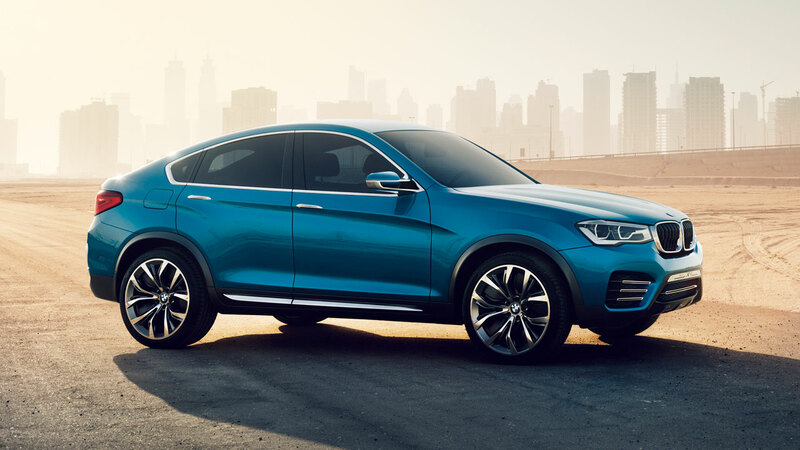 The second Sporty Activity Coupé in the brand´s model range will be built at BMW Plant Spartanburg in the USA, the competence centre for BMW X models which also produces the BMW X5, BMW X6 and BMW X3. The sporting character of the BMW Concept X4 is articulated by its dynamic lines as well as its proportions. With a body length of 4,648mm, a width of 1,915mm and a height of 1,622mm, its exterior dimensions signal sporting elegance and powerful robustness. In addition to a long bonnet, short overhangs and set back passenger cell, its signature BMW features include a long wheel-base measuring 2,810mm, while 21-inch light-alloy wheels lend an added flourish to the athletic bearing of this Sports Activity Coupé. A front end with urban sporting presence. 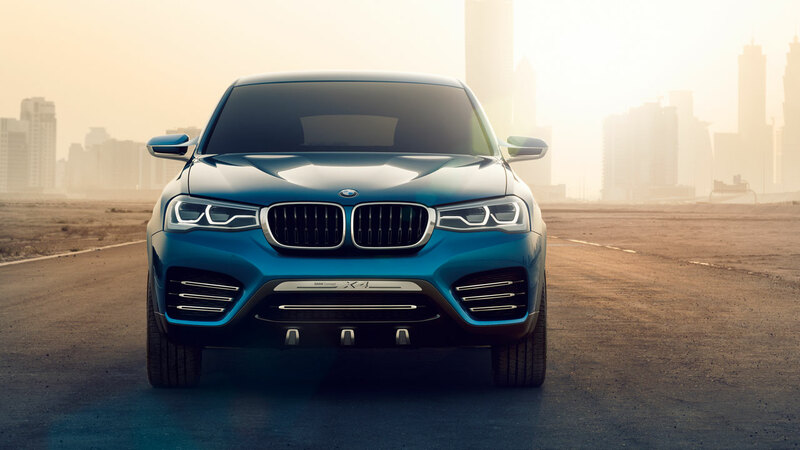 The front-end styling of the BMW Concept X4 exudes hallmark BMW dynamics and the rugged purpose and presence of a BMW X model in equal measure. Classic BMW features such as the kidney grille and stylised twin circular head-lights give the front end a clear identity and ensure it shines out as a BMW the first time you set eyes on it. The BMW Concept X4 lavishes both these front-end design icons with meticulous detail and three-dimensional depth. The large kidney grille stretches out within a solid-looking surround. The high-gloss frame is open to the sides and at its lower extreme, lending it an almost “floating” appearance in the centre of the front end. The grille features prominently sculptured bars with stylish detailing. The hollowed out, high-gloss black bars have a milled lower third with a matt finishing, which lends the kidney structure extra visual depth. And the grille also comprises additional air apertures to ensure an increased supply of cooling air to the engine. This dynamic impression extends to the front apron. In keeping with BMW Coupé tradition, the side air intakes are larger than the inner units and make a visual feature of the increased cooling air requirement – while satisfying that need. Together with the car’s wide track and low centre of gravity, the intakes represent a promise of exceptional performance capability. The side air intakes pick up on a stylistic theme from the kidney grille; their black horizontal bars are, like the grille’s, partly milled out but boast gleaming chrome edges. It all makes for an enticing contrast of materials, a fusion of high-end quality with the characteristic robustness of BMW X vehicles. This design theme concludes in the under-ride protection, where three milled out, gleaming chrome elements present a high-quality take on the modern preference for minimalist solidity. 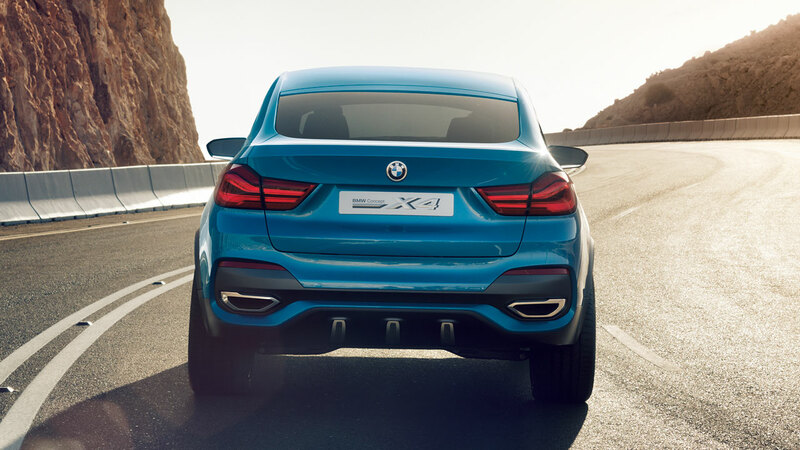 The qualities of a BMW X model merge with the values of a BMW Coupé in the muscular silhouette of the BMW Concept X4. Its proportions present a persuasive case for the BMW Concept X4 as the most dynamic vehicle in its segment. In hallmark BMW style, a longer wheelbase, relatively long bonnet, short over-hangs and a set-back glasshouse lend the car an undeniable dynamism even when standing still. The striking interplay of surfaces creates a vibrant contrast of light and shadow that exudes a feeling of agility and power. Prominently rising lines mould the flanks into a wedge shape and give the car as a whole a forward-surging momentum. The coupé-style roofline sweeps elegantly downwards and makes the car appear longer. Below, the windows extend well to the rear, where they are bordered by a dynamic interpretation of BMW’s signature Hofmeister kink. The stretched and shallow band of glass creates a persuasively dynamic link between the glasshouse and vehicle body, the slim glass surface giving the body a powerful appearance. At the same time the visual centre of gravity is lowered, underlining the sporting mission statement summed up by the car’s flanks. The shallow rear window gives the vehicle body an even more powerful impression and its broad shoulders a show-stealing presence. Looking further down, the L-shaped rear lights of the BMW Concept X4 underscore its consummate stance on the road. A full-sized inner element in the tail lights, meanwhile, replicates the signature BMW “L” shape in three-dimensional form with impressive depth. The under-ride protection acts as the body’s lowest edge. Matt black surfaces lower the car’s perceived height and accentuate the robust BMW X character of the rear. At the front of the car, three milled elements in gleaming chrome add a sophisticated touch to the under-ride protection.